Adam visited Kansas City at the end of October 2018 when Queer Eye was filming their third season for Netflix. He and ABC News producer Robert Zepeda mentioned in the latter’s Instagram story to look for their segment “next March” [link to a group photo on Zepeda’s Instagram account]. UPDATE: Season 3 is set to launch on March 15, 2019 and Adam’s behind the scenes segment with the Fab 5 will air on Good Morning America on Wednesday, March 6, 2019. Adam surprised Marie Kondo (of Netflix’s “Tidying Up with Marie Kondo”) as she picked out her dress to wear ahead of the February 24th Oscars red carpet [click here to watch on Access’ YouTube channel]. Adam will be a guest judge (show episode date TBA) on Season 11 of VH1’s “RuPaul’s Drag Race” [as published in this 2/19/19 press release on Futon Critic]. Adam promoted the upcoming ISU Four Continents Championships at the Honda Center in Anaheim, California on ‘Good Day LA’ on February 4, 2019 [click here to watch his 2-minute video interview]. He is scheduled to co-host the Four Continents Exhibition Gala that will start at 6 p.m. Pacific time on Sunday, February 10. Adam hosted the 2019 North American Hairstyling Awards, produced by the Professional Beauty Association, on Saturday, January 26 in Long Beach, California. The livestream [can be watched on demand here] (online registration is required). Adam spoke at the 3rd annual Women’s March in Los Angeles’ Pershing Square on January 19, 2019. A video clip of his speech can be watched both [on NowThis Sports’ Facebook page] and [NowThis’ Twitter account]. He also explained why participation is important to him [in a clip posted on Access’ YouTube channel]. Adam was on the first 20 minutes of the third hour of the TODAY Show on Wednesday, January 2, 2019: [watch a 3-minute clip on the TODAY show’s Twitter account]. A longer clip [ can be viewed on Today’s YouTube channel]. Adam was featured in NBC’s A Toast to 2018 (Monday, December 31, 2018 from 8:00-10:00 pm ET), hosted by Kathie Lee Gifford and Hoda Kotb, “a star-studded New Year’s Eve primetime special highlighting the year’s biggest pop culture moments, videos and trends.” [brief clip of Adam on Dateline NBC’s Twitter’s account]. Adam was one of Samantha Bee’s special guests in her Full Frontal show’s holiday episode on TBS that aired on Wednesday, December 19, at 10:30 p.m. Eastern/Pacific time [watch their segment on the show’s YouTube account]. He also filmed on the ice with Samantha on December 3 [view their minute-long promo on the show’s YouTube account]. More links are posted on the NEWS page. Adam filmed a segment in Laramie, Wyoming about the 20th anniversary of Matthew Shepard’s death for ABC’s Nightline that aired on Thursday night, October 11: [link to watch the video] (Adam appears at the 6-minute mark). Shepard, a 21-year-old college student, was brutally attacked in an anti-gay hate crime on October 7, 1998, and died 6 days later from his injuries. Adam recounted Shepard’s story for Now This Morning [link to watch the video on their Facebook page]. Adam has completed filming on ABC’s Dancing with the Stars: Juniors which premiered on Sunday, October 7, 2018 from 8-10 pm ET. He is one of 3 judges on the show and upcoming episodes will air in its regular time slot of Sundays from 8-9 pm ET [link to ABC’s website for DWTS: Juniors]. The show’s finale was broadcast on Sunday, December 9, 2018. Adam will make his scripted television debut as a guest star in an episode of Will & Grace this fall on NBC [view Matt Bomer’s Instagram Story selfie with Adam as published in this People article]. Broadcast date: Thursday, November 29 at 9 pm Eastern & Pacific/8 pm Central. Adam taped an interview with actress Cate Blanchett [view their photo on his Instagram] for ABC’s Good Morning America that was broadcast on Friday, September 21. Go to the NEWS page for the link to the video and recap article. Adam was a guest on the first episode of the 11th season of MTV’s “Ridiculousness” that premiered on Sunday, August 5, 2018 at 8 pm ET/PT. MTV’s website has uploaded 2 clips on their website: [Clip 1][Clip 2]. For future re-broadcasts of Adam’s episode [check TV Guide’s online listing]. Saturday, November 3: “An Evening with Adam Rippon” at the University of Minnesota in Minneapolis [info about his Q&A session and ticket information]. 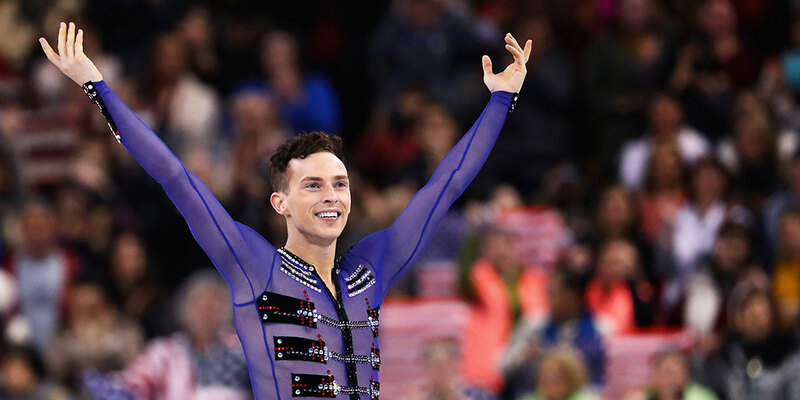 Thursday, November 1: “An Afternoon with an Olympian – Adam Rippon” at the University of Utah (free to the University community) [event info]. Link to a video of his speech and his mother’s introduction of him is posted on the NEWS page. Wednesday, October 17: Adam spoke to Ohio State University students about “his work as an LGBTQ+ advocate, athlete and rising star” [link to OSU Multicultural Center’s LGBTQ History Month page]. Saturday, October 6: Adam spoke on the topic “Eat Like A Champion” at EEEEEATSCON New York from 2:00-2:45 pm in Forest Hills Stadium in Queens, New York [event information & website] [view a photo of him onstage on Twitter]. Adam was a guest speaker at the Forbes Under 30 Summit Boston on Monday afternoon, October 1, 2018 [event information]. He spoke on the topic of “Owning Your Brand: Authenticity and the Fame Game” with comedian/actress/producer Esther Povitsky. Links to video and photos are posted on the NEWS page. Thursday, September 27: Adam participated in the Equality Keynote session at the 2018 Dreamforce Equality Summit in San Francisco, California, organized by Salesforce. A video link is posted on the NEWS page. Adam spoke at Marriott International’s launch of their inaugural #LoveTravels Beyond Barriers Summit in New York City on September 25: [view a photo of him on the company’s Twitter account]. #LoveTravels represents Marriott International’s celebration and support of inclusion, equality, peace and human rights. Monday, September 24: Adam participated in LARAMIE: A LEGACY, a benefit reading of The Laramie Project to honor the life and legacy of Matthew Shepard, at the Gerald W. Lynch Theater at John Jay College in New York City. Links to articles and photos are posted on the NEWS page. Saturday, September 15: Adam attended the 22nd annual Human Rights Campaign National Dinner in Washington, D.C. as [ confirmed in HRC’s tweet] [link to event website]. Links to video, article & photos are posted on the NEWS page. Adam and Mirai Nagasu celebrated their DSW partnership by hosting a meet & greet at the DSW store at 79th Street and Broadway in New York City [click here to view 2 photos] on Saturday, September 8 from 1-4 pm. Adam headlined the final SUN VALLEY ON ICE show of the summer on Saturday, September 1, 2018 in Sun Valley, Idaho and performed his two Stars on ice tour solos (Adele’s Remedy” and his “Let Me Think About It” SP). Adam was a featured speaker at NEWBO EVOLVE (inaugural festival in Cedar Rapids, Iowa, August 3-5, 2018, that “celebrates the creative bohemian spirit through music, art, fashion, dance, food, and technology”). With 2 different moderators at the Cedar Rapids Convention Complex, Adam first opened up “about how his life changed dramatically when he made the choice to just be himself and the freedom that came with it, both on and off the ice” in Being My True Self from 2:30-3:30 pm on Saturday; then he “shared his inspiring story and where he found the drive to keep working toward his Olympic goals despite challenges he faced” in What Inspires Me from 2:30-3:30 pm on Sunday [link to the event website]. Links to a video, article & photos are posted on the NEWS page. Friday, June 8: Adam was honored with a proclamation by the New York City Council’s LGBT Caucus at 11:30 am on the steps of New York City Hall. Video, articles & more are posted on the NEWS page. Monday, June 11: Adam co-hosted (with Gus Kenworthy) the TrevorLIVE New York gala at Cipriani Wall Street in New York City. The NEWS page has video/article/photo links. Friday, June 15: Adam taped an episode of MTV’s “Ridiculousness” show with Rob Dyrdek in Van Nuys, California [link to show’s website]. Saturday, June 16: Adam was the special guest at the three-time WNBA Champion Phoenix Mercury basketball team’s celebration of PRIDE Night and participated in a halftime Q&A at center court: [read the original press release here]. Monday, June 18: Adam was one of the speakers at the the Opening Plenary session of the Service Unites conference (formerly called the Conference on Volunteering and Service), powered by Points of Light, 4-6 pm at the Fox Theatre in Atlanta, Georgia [WATCH his speech here]. June 19-21: Cannes Lions 2018 “international festival of creativity” in Cannes, France [link to the event website]. More information can be found on the NEWS page. “Adam Rippon and Mirai Nagasu broke the ice on their new DSW partnership by hosting a DSW Block party at the 34th street store in New York City on Wednesday, June 27 from 4-7 pm EST. The event was free and open to the public.” Refer the the NEWS page for articles and photos. Tuesday, June 5: “Pride Party at Sea” – Flagship Party on the Celebrity Summit, Kings Wharf, Bermuda: [view publicity flyer here]; [view Adam’s photo with some of the Celebrity Cruises’ staff here].